Let's start from the beginning: what is a logarithm? What is antilogarithm and how to calculate it? 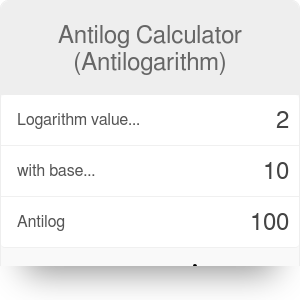 Thanks to the antilog calculator you can calculate the inverse logarithm function. Calculate the antilogarithm of any number with any arbitrary base - whether it is 10, natural antilog or any other number. If you are not sure what the antilogarithm is, read the description below where we explain everything step by step. The logarithm is the inverse function to exponentiation. That means the logarithm of a given number x is the exponent to which the base b must be raised to produce that number x. Since log and antilog are inverse functions, then this means that x = by = blogbx, and y = logbx = logb(by ). Decide on the number you want to find the antilogarithm of, let's say it's 3. Type your base - assume we want to calculate the natural antilog. We can enter the approximation of Euler's number which is equal to 2.71828 or just type "e" - the calculator understands it. The antilog value appears below: it's 20.086 (third power of e). Wasn't that easy with our antilog calculator? Antilog Calculator (Antilogarithm) can be embedded on your website to enrich the content you wrote and make it easier for your visitors to understand your message.